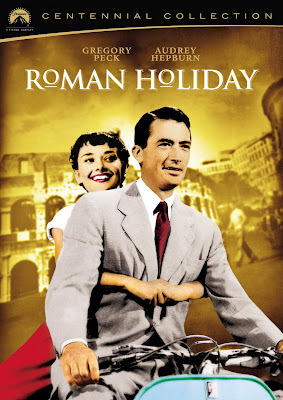 Initially intended to be filmed by iconic Italian-American director Frank Capra as a sort of re-imagined update of his Oscar winning 1930s screwball classic It Happened One Night and set to star Cary Grant and Elizabeth Taylor, Roman Holiday eventually lost all three of those attached. The first change occurred when Capra balked at working with blacklisted screenwriter Dalton Trumbo and after Taylor was recast with the young, adorable Belgian newcomer Audrey Hepburn, the self-conscious Grant felt he was much too old to play her leading man. Jumping ship and studio to Paramount where it would become one of the best loved films of not just the '50s for Paramount but helped garner the studio three more Oscars (including one for Hepburn), it's also become one of the most treasured romantic comedies of all time, finally earning the chance for eternal preservation in the Library of Congress National Film Registry where it was dubbed "culturally, historically, or aesthetically significant" in 1999. While its similarities to It Happened One Night are definitely apparent, there's no mistaking the two works as-- where Night was screwball and distinctly American-- Holiday was fairy-tale rooted and far more exotic, blending together not just the Italian location but the Belgian actress Hepburn, her American costar Gregory Peck, and German born director William Wyler. Moreover, it's a free-spirited, wonderfully uplifting but startlingly bittersweet love story that uses the frame work of "what if," yet believably moves towards a logical conclusion that boy will lose girl after all. Following a legendary screen test that found the camera still rolling as Hepburn eased out of her nervousness and spoke candidly about her life, she starred in the career making role at the tender age of twenty-four and followed up Holiday with a half dozen additional pictures for Paramount over the next decade. Although Grant had backed out but would later fall prey to Hepburn's charms onscreen in the classic caper comedy Charade, Peck jumped at the chance to trade in the cowboy boots and dramatic roles to try his hand at comedy for the first time, though later admitting that every hand-me-down screenplay in the romantic genre seemed to have "the fingerprints of Cary Grant on it." However, after watching only twenty minutes of the film, it's hard to imagine anyone else in the role of American newspaperman Joe Bradley than "Mr. Integrity" himself and the man who would later become Atticus Finch in To Kill a Mockingbird-- namely, Mr. Peck. Bringing a no-nonsense angle to the role in a way that perhaps the suave and overtly smooth and sensuous Grant wouldn't have been easy to persuade viewers into buying quite as easily, we're fully invested in the characters by the time the two meet on a park bench under the Italian moonlight. Shortly after it begins, Princess Ann (Hepburn)-- having become exhausted by her demanding European goodwill tour and endless scheduling commitments for speeches on "youth and progress" or "trade relations" falls into hysterics following a draining ball. After a tantrum where she pleads for her handlers to "let me die in peace," her kindly doctor gives her a sedative to calm her nerves and tells her to do what she'd like for awhile. Yet instead of falling quickly off to sleep, Ann takes that literally, wandering Italy alone in the middle of the night but when the shot kicks in full blast and she falls asleep, she's rescued by Bradley who doesn't feel right about leaving a young woman alone in such a state. After a few unsuccessful attempts at trying to return her to her residence but realizing she is uncooperative, he grudgingly brings Ann back to his apartment where she finally gets the chance to wear pajamas and spends the night in a man's apartment for the first time (quite scandalous for the '50s although the film is remarkably chaste). It's only when he misses his appointment to interview the princess that Joe realizes that the princess who press releases are noting has fallen ill to avoid scandal is sound asleep back in his own apartment. Deciding that he's going to deliver the story of a lifetime in revealing the private and most innermost thoughts of a princess, Joe misleads the young woman, now calling herself Anya Smith, by befriending her under the guise that he works in fertilizer and chemicals. Spending a memorable day with the young woman, Joe recruits his photographer friend Irving (a hilarious Eddie Albert) who uses a mini lighter cam to take candid photos of the girl unaware. 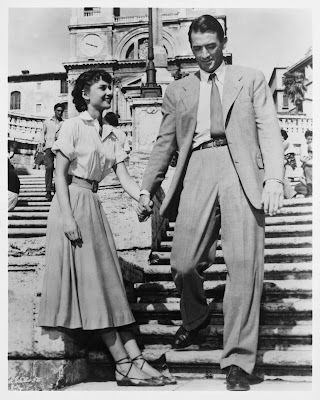 While of course, predictably the two fall in love as the adventure increases and they explore the most picturesque landmarks of Italy (which were filmed in black and white so as not to upstage the stars), the film impressively remains true to its characters, resulting in a finale that still manages to tug at our heartstrings today, no matter how many times we've seen the film and especially in the wake of the shocking death of Princess Diana in the late '90s. 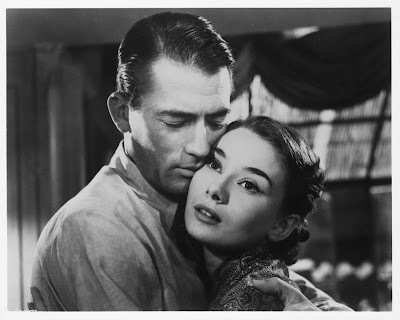 The chemistry between the relative newcomer and Peck is unmistakable and Peck was so blown away by the beguiling young woman that in an unprecedented and admirable move (while typical for the ethical Peck yet unheard of in the ego and male driven Hollywood), he demanded that Audrey Hepburn either receive top billing or share equal billing in the opening credits as he realized-- before anyone-- how this would become the ultimate showcase for its star and that in the end, it's Ann's story after all. Although it's not just a showcase but a sweeping sophisticated work and one of the few films set over the course of a little over a day that genuinely feels as compelling and authentic as it should as opposed to some of the gimmicky "real time" or "short time frame" films of today. And moreover, it's perhaps because of its pacing and the fact that it still feels a bit fresh in it's approach that-- although unsurprisingly to the film's cast and crew-- it's no wonder that those who encounter it for the first time find themselves enchanted right along with Peck by Hepburn's debut. Exquisitely transferred to DVD as the second offering in the Paramount Centennial Collection, this two disc must-own collectible set comes with a booklet filled with photos and facts and additionally, like the other two films released in the Paramount series so far, also goes above and beyond most classics in serving up a cinematic feast of knowledge on the second disc. In a thirty minute special "Audrey Hepburn: The Paramount Years," we get a biographical look at the star and her rise from a young woman in a war torn country whose system was ravaged by malnutrition who gave up her dream to become a ballerina and would later become one of the world's most recognizable actresses and fashion icons. In "Remembering Audrey," the anecdotes continue as family and close friends share their impressions of the woman she was away from the filmmaker's eye, either in her tireless charity work or in her devotion to others. Touring Italy in "Rome with a Princess," we get another sense of the travelogue aspect of the film as we learn more about the landmarks used in Roman Holiday and there's another fascinating and richly deserved portrait of screenwriter Dalton Trumbo "From A-List to Blacklist" as it's only within the last two decades that he finally received the credit he deserved on this wonderful film as his widow was presented with an Oscar in 1993 and his name was digitally added in the opening titles, according to the press release. Also including the popular "Paramount in the '50s- Retrospective Featurette," available on other titles, this disc's "Behind the Gates" segment fitting devotes its energy to the costuming department of the studio although most of the clothing discussed is too current and I wish more would have been elaborated on from this era, despite knowing that Hepburn received her entire Princess Anya/Ann Smith wardrobe. Likewise, I longed for a featurette on Peck who turns in a wonderfully understated comedic performance that gets funnier with each successive viewing, especially in his best scene opposite Hepburn and Eddie Albert when he keeps trying to prevent his friend from telling the princess of their true profession. 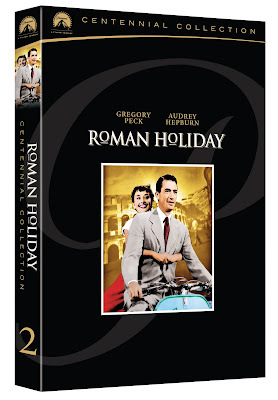 Also in a short but noteworthy bonus for film scholars, we're given a succinct roughly seven minute look at "Restoring Roman Holiday" as we're taught the difference between preservation and restoration and the process the craftsmen went through to bring this gorgeous film to its DVD glory in a way that which I'm sure those involved would've been proud. Of course, while it's impossible to speak for Hepburn, Peck and Wyler-- speaking as an avid fan of Roman Holiday who counts it as one of her all-time favorite romantic comedies and one of the best Audrey Hepburn films, I can promise that although I've seen it so many times I can probably perform it from memory, it's never looked or sounded quite as amazing as in this set.